In 1925, Bob Gibson served barbecue from a makeshift table made of oak planks nailed to a large sycamore tree in his backyard. Fresh out of his hand-dug pit came smoke and smells that drew people from miles away. Weighing 300 pounds with a 6’4” frame, it was easy to see why friends and other railway workers called him Big Bob. “Your future is not in the railroad, but in Bar-B-Q”, said Roslyn Mitchell. 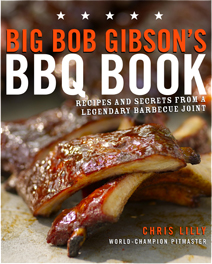 It was with that, Big Bob Gibson started a family barbecue restaurant tradition that has lasted has lasted over 80 years and 4 generations. Big Bob Gibson’s storefront bobbed up and down all over Decatur Alabama, always moving to a bigger and more populated location. He specialized in smoking pork and chicken in his hickory fired brick pits. Word spread of his Southern Flavors and Big Bob’s unique Bar-B-Q White Sauce recipe. Three things contributed to his success; his delicious food, that tangy White Sauce, and his charismatic personality. “Big Bob Gibson never met a stranger,” said Mattie Johnson, an employee for over 50 years. 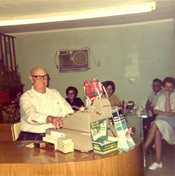 The tables were always full and the lines at the counter grew longer with people placing orders, and just wanting to talk to Big Bob. Demand for his food prompted him to initiate a curb service, where orders were taken and delivered directly to a customer’s car window. In the 1950’s all five of Big Bob’s children chose bar-b-q as their life passion. Big Bob’s daughter Catherine (Punk to friends), and her husband Coy McLemore joined the ranks. Soon customers were enjoying chocolate, lemon, and coconut cream pie, made fresh every morning. Another addition to the menu was potato salad. This added a touch of variety to the limited side items of coleslaw and potato chips, which Big Bob had always served. 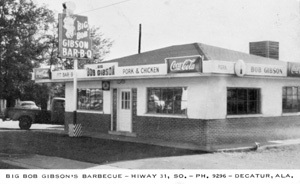 A new restaurant was introduced to Decatur in the 50’s, called Little Bob Gibson Bar-B-Q. A brother and sister combo of Ruth Hopkins and Bob Gibson Jr. joined their spouses to quench Decatur’s thirst for this southern staple. In 1956 another brother and sister tandem of David Gibson and Velma Hampton, along with their spouses, introduced the bar-b-q trade to Huntsville Alabama. 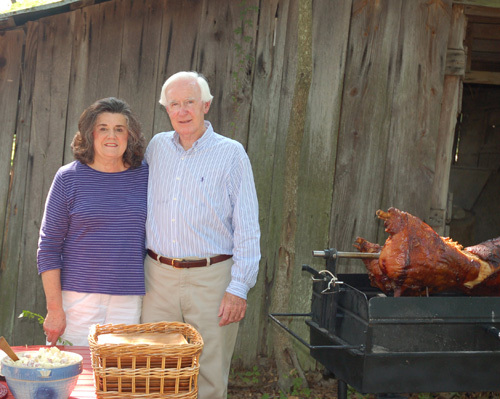 Soon, all of the Gibson clan was satisfying the craving for bar-b-q across North Alabama. Increased demand for bar-b-q meant two more cooking pits were needed at Big Bob Gibsons. Bar-b-q pits in those days had a large chimney on one end, with brick walls surrounding a flat cooking grate. Burning hickory coals were shoveled under the cooking grate, through holes in the bottom of the brick wall. The floor of the pits was clay soil. The clay floors would absorb grease from the pork shoulders and chickens. Every week, the floor would be shoveled out to a depth of two feet and replaced with fresh clay. The 1970’s and 80’s ushered in a growing Decatur and a new generation at Big Bob Gibson Bar-B-Q. Don McLemore, grandson of Big Bob, and his wife Carolyn took control of this Decatur landmark. More people coming to the city meant more customers in the restaurant. In 1987, a new restaurant was built to house an expanded kitchen and dinning room. An advertising campaign promoting catering was devised to target a large unfulfilled market. With the new facilities in place, annual catering jobs of more than 3000 people became a routine. A veteran crew and an assembly line approach to fixing plates made serving large groups both fast and efficient. These changes provided Big Bob Gibson Bar-B-Q with the opportunity to grow and to be recognized regionally as the best bar-b-q restaurant. “In the restaurant business, you never want to add a new food to your menu unless by adding that item you attract new customers”, said Don McLemore. With this in mind three new items were added in the next decade. Pork ribs began kissing the hickory coals for a full 5 hours at 240 degrees. The entrees available now included ribs, pork, chicken and beef. Carolyn rounded out the side order options with her traditional homemade bar-b-q baked bean recipe. 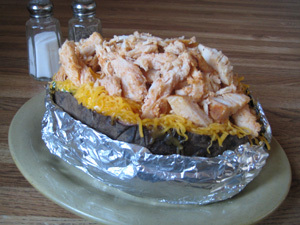 A huge success was the addition of bar-b-q stuffed potatoes. These giant spuds, once compared to “a Nimitz-class aircraft carrier” by Chile Pepper Magazine, are filled with butter, sour cream, bacon, chives, and topped with your choice of meat. Decatur is a city that is that is bordered by industrial parks to the West, the Tennessee River to the North, and Wheeler Wildlife Refuge to the East. The only direction that the city and the restaurant could grow is south. In 1992, Big Bob Gibson Bar-B-Q opened another location on the south side of town. This new endeavor baptized the 4th generation of the Big Bob Gibson family in hickory smoke. Great granddaughter Amy and her husband Chris Lilly joined the team and helped take the restaurant in a new direction. People raised in Decatur know that bar-b-q sauces are supposed to be white. Big Bob Gibson chickens are split, seasoned, and laid open on the pit for 3 ½ hours on 350 degrees. A pit full of 50 golden brown birds is then dipped into a vat of that tangy, peppery white sauce. The demand for this sauce prompted the bottling of this milky white liquid. Soon distribution of Big Bob Gibson Bar-B-Q White Sauce reached 8 states and over 2000 grocery stores. Bar-b-q is good for your heart and hickory smoke is good for your soul. Everyone from the South knows this is true. The non-Southern educated folks occasionally brought up still questions of calorie count and fat grams. How could Big Bob Gibson Bar-B-Q draw in the health conscious customers without compromising their traditional bar-b-q menu? The answer came with several new menu items. Marinated turkey breasts were pit-smoked and sliced to provide a tender new entree or a tasty sandwich. A mound of a customer’s favorite meat topped a bowl of mixed greens and vegetables to form a Big Bob Gibson Bar-B-Q Salad. This satisfied their cravings and provided the restaurant with a new customer base. In 1996 JedMaster was hired to build a large capacity portable-cooking rig for Big Bob Gibsons. With room for over 175 chickens, 110 slabs of ribs, or 60 whole turkeys, this pit increased the cooking capacity of the restaurant greatly. A pit on wheels enabled Gibson’s to offer a cook-onsite catering package. Instant atmosphere and advertising were obtained wherever smoke billowed from the stacks. With their time-tested recipes and the confidence that the best bar-b-q in the world has always been found in Decatur, Big Bob Gibson Competition Cooking team was formed. If they could they could win contests; this would provide excellent advertising and promotion for their restaurant and sauces. Win they did. 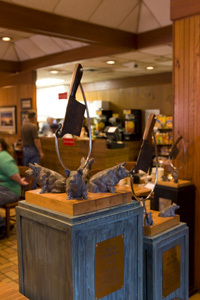 They have won 10 State Championships and 10 World Championships with their now famous pork, chicken and beef products. Their wins included being named Grand Champion at the 2000, 2003 and 2012 Memphis in May World Championship Cook-offs, and Grand Champion at the 2004 American Royal International Invitational Barbecue Contest. What does the future hold for Big Bob Gibson Bar-B-Q? More restaurants, more sauces, and more contests would be a good guess. Only one thing is for certain, more of the Best Bar-B-Q in the world will be served today, in Decatur, Alabama.